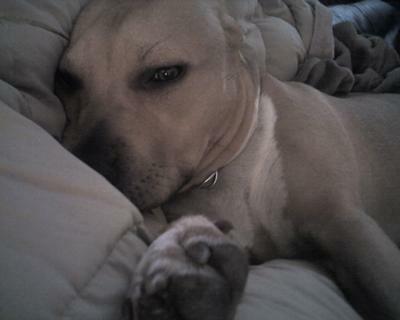 Lola is a 4 year old American Staffordshire Terrier. She has been our baby since she was 6 weeks old. She enjoys sleeping in the sunlight - family fun time, long walks and short sprints, her special time with grandpaw & playing with her cousins, an 11 year old Rottweiler, Boxer puppy, Carin Terrier puppy, a Hound/Lab mix and a little tiny Yorkie! She is a special little girl and we love her more and more as each day passes!